Manage the installation of a brand-new Drupal website, and permit radically different starting points: Drupal as a CRM, or Drupal as a shop. Encapsulate the entire display layer of a Drupal website, containing (in theory) no business logic and interchangeable for another theme at a later date. 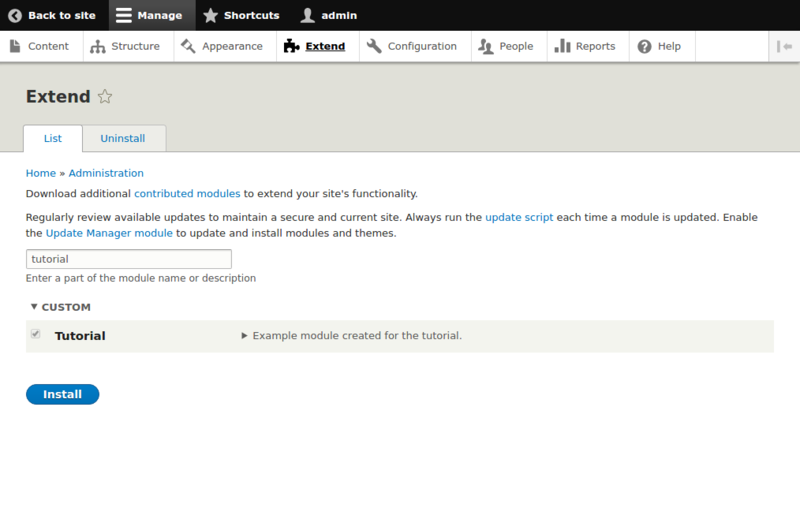 Modify and extend the way Drupal behaves with new functionality, logic, structure, content, behaviours etc. For the purposes of these tutorials, the most straightforward way to extend Drupal is with a module, and we focus on those. Almost all of the code examples will be in the same module. In Drupal 8, modules, themes and profiles all standardize on the suffix .info.yml for the filename, and structure the contents of the file according to the YAML specification. What do you call your module folder? Well, Drupal has a longstanding (but slightly ambiguous) concept of a "machine name": in practice, it usually means any number of word or words, made from lowercase a–z and the numbers 0–9, with the whitespace between them replaced by underscores, and not containing any other punctuation except (sometimes, but not for module names) hyphens and (sometimes, but not for module names) dots. So hello_world_123 is a good example, but hello world! is not. In addition, to avoid possible conflicts later owing to Drupal's concept of hooks (not in the scope of this blogpost) you might also want to reduce the machine name to a single word, without any underscores: helloworld123. Once you've decided on a provisional machine name, you should also make sure it doesn't already exist as a contributed extension you might want to use in the future: in this example, try visiting http://drupal.org/project/helloworld123. It doesn't exist, so we could go with this as our machine name. That's a bit of a weird name, though, so for the sake of the rest of this blogpost we'll use the machine name d8api. Your particular site folder should be sites/default as above, as you probably don't want to use multisite. For now, let's assume you've created the folder sites/default/modules/d8api. The name of the file which contains your module's metadata should be the machine name, followed by .info.yml, and go in the top-level folder of your module. So, assuming the machine name above: sites/default/modules/d8api/d8api.info.yml. Aside: you can use a different machine name for this metadata file, from the folder name. Don't do it! Keep the machine names the same. For a long time in Drupal 7 there was a module called googleanalytics where all of its files' names began google_analytics. *—or maybe it was the other way round. That's the point, in fact: it was always difficult to remember the difference, and there was no benefit from them being different. Keep the same machine name, kids. description: Example module created for the tutorial. The (human-readable) name of the extension. A short (human-readable) description providing further information. That this extension is of type "module" and not "theme" or "profile". You might add a package: ... line to help the Extend page (see below) put your module with others that provide related functionality. If you're interested, you can also read more about the possible contents of this metadata info file. Module-level configuration, for settings, routes, menu items etc. However, here we've only covered the bare minimum to begin your module, and you should already be all set. You can then enable this module. It doesn't do anything yet, but: congratulations! You've just created the bare minimum of a Drupal module.